A magnesium thiosulphate, a clear, chloride free solution, where magnesium and sulphur are supplied in one highly plant available product. Thio-Mag is a neutral to basic solution that remains stable under all conditions. A very effective and efficient source of magnesium in a variety of crops. Magnesium in the form of thiosulphate is extremely available to the plant and taken up very efficiently for a rapid response. The thiosulphate molecule provides both sulphate sulphur for immediate plant uptake and elemental sulphur for sulphur for prolonged released. Sulphur is essential for chlorophyll formation and therefore photosynthesis. Campbells Thio-Mag is suitable for use in vegetables, fruit, vines, flowers, turf and ornamentals. As a nitrogen free fertiliser, Thio-Mag is a preferred source of magnesium and sulphur when nitrogen should be limited. The properties of Thio-Mag mean that once applied to the soil, it will stay in soil solution for longer, giving roots prolonged access to nutrients. The presence of sulphur ensures efficient nitrogen utilisation within the plant. Campbells Thio-Mag does not contain harmful chloride or heavy metals in an easily to used liquid form. 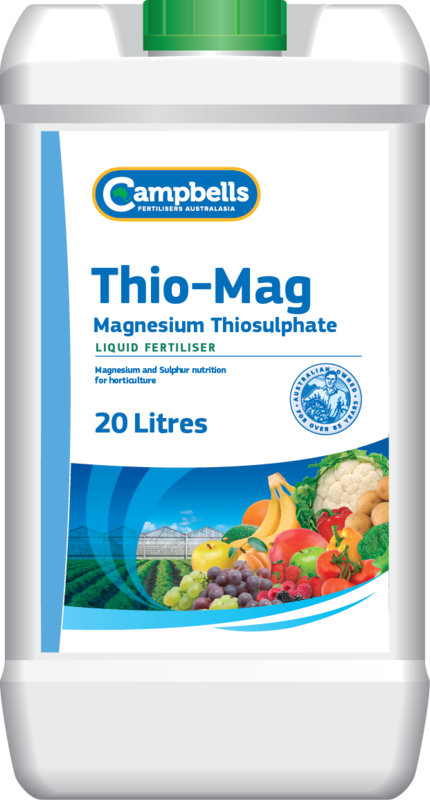 Campbells Thio-Mag is ideally applied via fertigation as a magnesium source throughout the growth season. As it is very efficiently taken up by plants, Thio-Mag can be applied in response to plant or visual analysis to correct or prevent magnesium deficiencies. Thio-Mag is well suited to high value fruit and vegetable crops where colour and visual appearance are important to the end product. General rates for horticultural crops are between 20-40 L/ha in a single application. When applying Thio-Mag through the irrigation system smaller, more frequent applications are recommended for efficient uptake. The actual rates, number of applications and their timing will vary considerably for different crops and for different districts. Before application, seek advice from your Campbell’s Thio-Mag distributor or your local agronomist.